Chocolate Chip Banana Skinny Bread by Daily Cup of Asheejojo! Happy Wednesday all! We are so excited to introduce the adorable Ashleigh from Daily Cup of Asheejojo - she is sharing her skinny Banana Bread breakfast recipe which is so good it could easily pass as dessert :) Hope you all enjoy! Hi everyone! Ashleigh here from Daily Cup of Asheejojo. I am so excited to share one of my recipes on I Don’t Go To The Gym! This is a banana bread that has been “skinnified” to be a great breakfast, mid-day snack, or even a light dessert! This skinny banana bread uses natural and unprocessed ingredients. It’s added-sugar-free, grain-free, gluten-free, dairy-free, and Paleo! You can also make it a loaf or opt to portion it out into muffin tins. 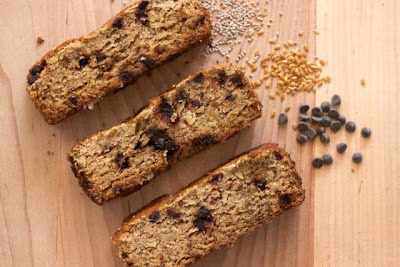 Instead of the usual banana “nut” bread, this banana bread utilizes healthy seeds (chia and flax) to increase the amount of good fats and omega 3’s. 1. Preheat oven to 350 degrees F. Grease a 5x7 inch loaf pan with some coconut oil. 2. Mix together the bananas, coconut oil, raw honey, vanilla and eggs. 3. Add the almond meal, coconut flour, baking soda, and salt. Mix until incorporated. 4. Stir in the chia seeds, flax seeds and mini chocolate chips. 5. Spoon the mixture into the prepared loaf pan and even out the top. 6. Bake for 30-34 minutes or until golden brown and a toothpick inserted into the center comes out clean. 7. Let the loaf cool in the pan for 15 minutes. Invert pan and transfer to a wire rack to cool completely. YUMMMM! Thanks Ashleigh! I was looking for a healthy banana bread recipe & this one totally fits!